Crawl spaces are one of the top hot-spots for mold development in residential and commercial properties. Crawl spaces tend to be especially susceptible to mold development due to its vulnerability to moisture problems. All that porous building material and a potentially poor building envelope design with insufficient ventilation can contribute to crawl space moisture buildup and potentially mold development. Mold is the consequence of unaddressed crawl space moisture problems. The experts at Mastertech of Tidewater can help. Mastertech Environmental’s crawl space mold removal experts in Virginia can determine if your crawl space has a mold problem, how bad the problem is, identify what caused the problem and develop a safe and effective crawl space mold removal solution. 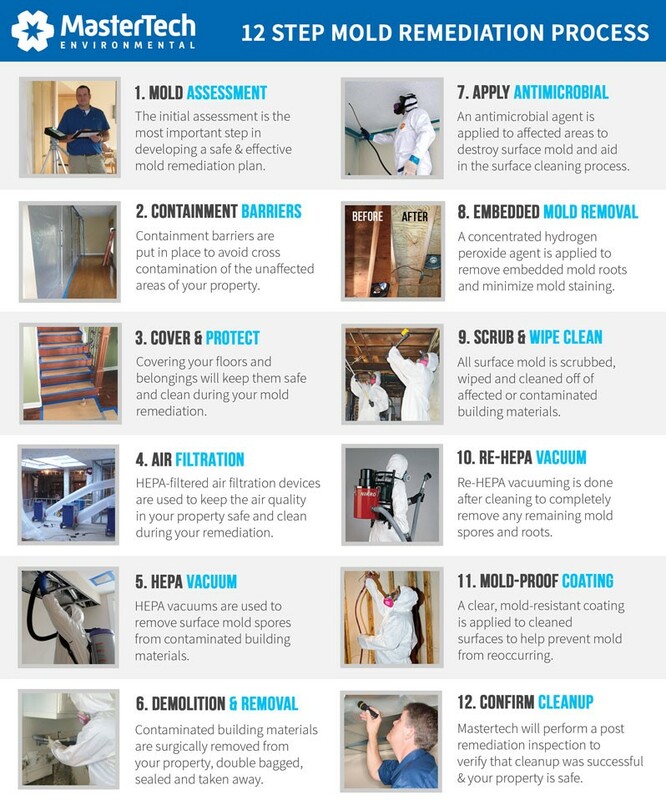 The key component of our mold removal solution will be prevention. We will make recommendations for proper preventative tactics to avoid recurrence. A thorough crawl space mold inspection in Virginia, completed by a trained and certified mold inspector, will determine if you have mold, how bad it is, what caused it, how to remove it and how to prevent its regrowth. Moisture Mapping– During your crawl space mold inspection, your inspector will carefully map out the damp or wet areas of your crawl space to diagnose the water source and understand how many areas have been affected. At Mastertech Environmental our team has worked hard to develop a mold remediation process that guarantees the best results. Our team is fully licensed, certified and insured to provide mold removal services throughout Virginia and the Tidewater Region. Each mold technician is carefully trained according to our intensive training guidelines, and we maintain strict adherence to all safety protocols. Our top priorities are, and will always be, client safety and quality control. The trained and certified crawl space mold removal technicians at Mastertech of Tidewater understand the importance of proper mold removal. A neglected or poorly addressed mold problem can leave home and business owners with serious consequences, like additional property damage and potential health implications. That is why our team is committed to providing the safest, most effective and most efficient mold removal services possible. Every mold removal, completed by Mastertech Environmental, is backed by a 5-year, mold-free warranty. It is the Mastertech promise that the mold has been successfully removed and it will not return. You can trust that we will go the extra mile to ensure the job is done right. If you detect signs of potential mold development in your crawl space, call 1 (757) 932-2772 today to learn more about our mold removal services in your area of the Tidewater Region of Virginia. A member of specially trained team will be happy to answer all your questions and set you up with an appointment with a licensed and certified crawl spaces mold inspector. Mastertech of Tidewater also provides the following mold removal services throughout the Tidewater Region: attic mold removal Virginia and basement mold removal Virginia. Mastertech Environmental is proud to provide our top quality mold services to home and business owners throughout the Tidewater Region of Virginia. If you are in need of crawl space mold removal services in any of the following areas, please give us a call today!